Viewing Bill Murray’s “Scrooged” last week for the twenty-fifth time in as many years, I recalled a kind of holiday miracle I witnessed shortly after I began consulting. I was working with a manager team at a food processing plant shortly before Christmas, observing a packing line set up especially to pack hams for the holiday. Imagine a rapidly moving serpentine conveyor transporting hams from a chiller to a rotating shrink wrap platen and thence to boxing and palletizing operations. Operators stood at key points, to inspect, load and unload. 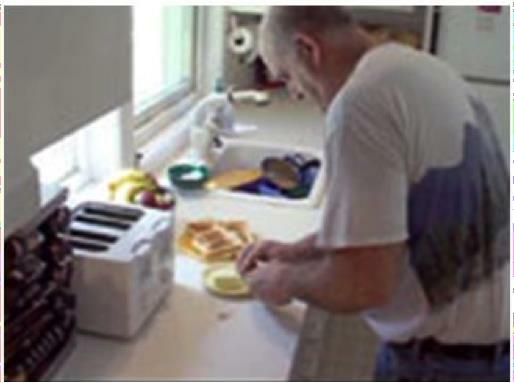 Because the shape of each ham was unique, proper positioning and repositioning of product was also important to prevent jams and spills. Observation was something new for this manager team. Not that they weren’t on the floor regularly, they just didn’t spend much time focused on the process. This day we were essentially standing in Ohno’s Circle, watching the work of young lady, call her Martina, stationed at the sealing platen. Hams arrived every twenty seconds on a conveyor positioned next to the platen, where Martina would quickly do a visual inspection and then load and activate the shrink wrapper. The packing line was paused briefly, and with the help of her bilingual supervisor we inquired of Martina if she experienced any difficulty in her work. As none of our group could speak Spanish, we could only observe facial expressions and body language. Her supervisor spoke to her in Spanish and then turned to us with a smile on his face: “I asked if she has any problems and she responded that ‘she really likes working here.’ I think she’s a little nervous.” Martina was looking at our team with a big smile also. The packing line was restarted, and we observed this time with a better understanding, watching for the occasional falling ham. There were a couple near misses, but no opportunities for Martina to demonstrate her first base stretch. So it is with occasional problems; only the front line sees them. My New Year’s challenge to every manager: Show your personal passion for continuous improvement every day. Make the miracle happen in your organization. Make your employees and yourself visible. Best Wishes to All for an Incredible 2015. P.S. GBMP wants to help you get 2015 off to a great start with lean training events to benefit your whole team – including Job Instruction Training, Lean for the Office, Six Sigma Green Belt, Total Productive Maintenance, Value Stream Mapping for Healthcare, benchmarking plant tours, free webinars, Shingo Institute workshops and much much more! Visit www.gbmp.org and click on Events to see the entire list. This entry was posted in Old Lean Dude and tagged bruce hamilton, employee engagement, GBMP, gemba, lean manufacturing, lean thinking, lean training, Management Kaizen, ohno circle, Taiichi Ohno, Toast Kaizen on December 31, 2014 by GBMP. When the panel discussion concluded, I retreated to further reflection: “Maybe,” I thought, “there never was a social part of Lean, only a set of techniques to be implemented and layered over a traditional organizational structure that valued only a few “thinkers” and treated everyone else as expendable ‘doers.” Maybe this was why the focus shifted in the early ’90s from Total Employee Involvement to Some Employee Involvement: Blitz Kaizen teams and black belts and subject matter experts and value stream leaders, none of which existed in the pre-Lean era. Maybe the Total part was just too hard or too foreign, so we retreated to our caste system of thinkers and doers and glommed onto the technical part of TPS. Technical problems, after all, are always so much easier to solve than people problems. In the late 80’s, Productivity Press (now CRC Press – then the leader in bringing TPS thinking to America) published an excellent “TEI Newsletter”, a resource that provided tremendous insight about creating the environment that we are now referring to as ‘people powered excellence.’ I have all the old issues, but there is no reference to the newsletter on the Internet; and no reference to TEI in the popular Lean Lexicon or any other glossary I researched. The acronym and what it stands for have apparently been expunged from our Lean consciousness. For those of you who’d like to revisit this prehistoric concept I recommend reading The Idea Book, authored by the Japan Human Relations Association in 1998. The book (once published by CRC Press) is now out of print, but available on Amazon for $0.01. Digging farther into the pre-Lean period is another seminal text by William Ouchi, entitled Theory Z, a seminal dissertation penned in 1982 on creating a management system that stimulates employee engagement and loyalty. This book came to mind during my keynote panel discussion. I wondered how many of the 1500 persons in the room had ever heard of it. Theory Z is also now out of print and available on Amazon for $0.01. Ouchi’s book is largely reflective of W. Edwards Deming’s thinking, and is still very important reading. My post-panel musings caused me to venture to the AME exhibitors area for a visit to the CRC Press booth to peruse their latest offerings. Nearly all of the display was comprised of technical how-to books: 5S, A3, 3P, kaizen events, policy deployment, value streaming for this and that, and a host of Lean-for… texts (Lean for sales, Lean for healthcare, Lean for accounting, etc.) I asked the salesperson, “Do you still publish Ohno’s and Shingo’s books? I don’t see them here.” He replied, “Yes we do, but we only bring new books to the conference.” (Shingo’s 1988 book, Non-Stock Production, is happily still in print, if not on the shelves.) As he answered, I recalled a warning from Shigeo Shingo that we should “not confuse means with ends,” for example, don’t think of 5S as an end in itself, but as a means to a higher purpose. All I saw for sale however was means type texts from latter day disciples. Apparently the works from the likes of Shingo and Ohno and Ouchi have become more like the Dead Sea scrolls: they still exist, but almost nobody reads them any more. Call them the Dead See Scrolls to disambiguate. Don’t miss this important Shingo Institute training event, Discover Excellence. This entry was posted in Old Lean Dude and tagged bruce hamilton, employee engagement, GBMP, lean manufacturing, People powered excellence, respect for people, shigeo shingo, Taiichi Ohno, TEI, The Shingo Institute, Total Employee Involvement on November 26, 2014 by GBMP.